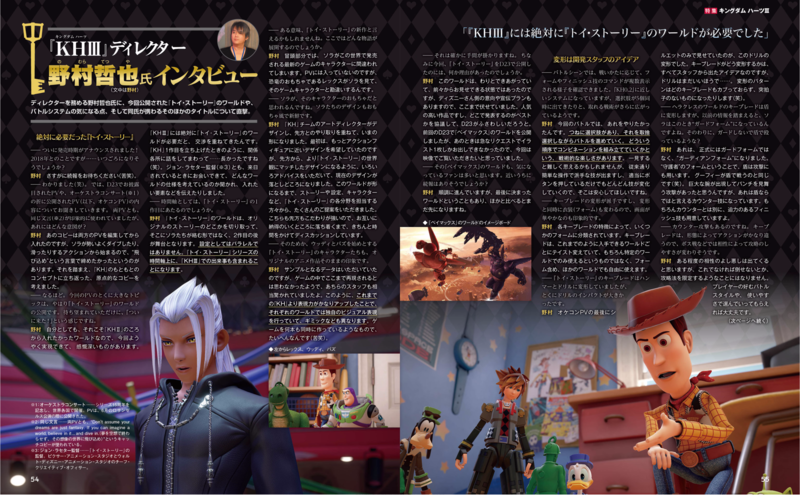 The latest issue of Famitsu Weekly has been released and includes a large spread on KINGDOM HEARTS 3 covering the Toy Story world reveal, new battle systems, and interview with Tetsuya Nomura! We'll have full translations of the interview soon, but the summary is available now for your reading pleasure. Update (7/20/2017): Saken has translated the first half of the interview! The world that was absolutely necessary, Toy Story! — The release window for KH3 has finally been announced! 2018… Do you have anything more specific? — Knew it (laughs). So, I’d like to ask about both the trailers released at D23 and at the orchestra concert. In both, we see the same words appear on the screen in impressive displays. What’s the reason behind this? 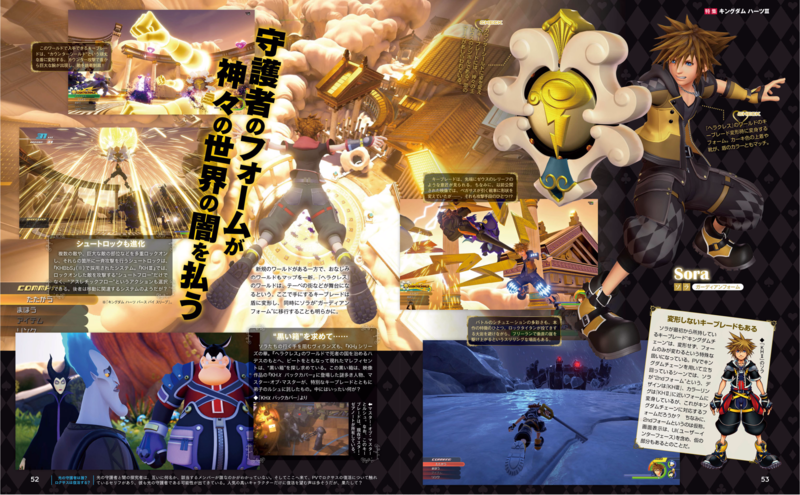 Nomura: The trailers begin with Sora performing vibrant actions such as vigorous dives and athletic slides, so I wanted the phrase to end in “dive in”. Considering this, I also thought back to the original concept of Kingdom Hearts, and came up with the phrase you see as a sort of throwback to its own roots. — I see. Something that’s definitely a hot topic this time is the announcement of the “Toy Story” world. Having been so eagerly awaiting this moment, it’s sort of like a “It’s finally here!” feeling inside. 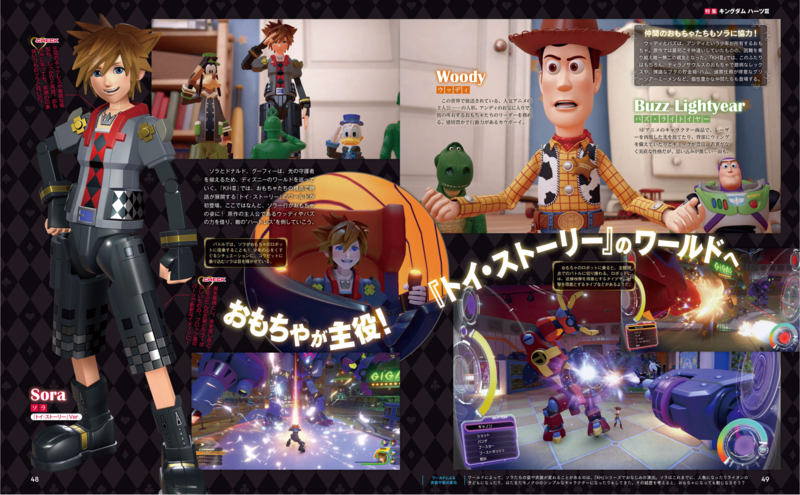 Nomura: I’ve been wanting to add Toy Story in from since KH2, so even for me, I’m welled up with emotion finally seeing it implemented. For KH3, a Toy Story world was absolutely necessary. With these thoughts, and after many discussions, here we are. Just like we did back with KH1, we had to relentlessly consult with all related parties… It was quite a long process (laughs). For example, when John Lasseter* had come over to Japan, I was asked about the way I was thinking of implementing the worlds(**), and I would tell him about the types of things I wanted to include, and so on. — According to the Toy Story timeline, does this fall about the time of the 1st movie? Nomura: The Toy Story world isn’t simply a sort of abridged telling of the original Toy Story plot with Sora and co. being thrown in. The events that occur take place after the 2nd movie. The setting of the story is not in a parallel plane to the original. Everything that happens in KH3 will be on the same timeline as the Toy Story series. — By that, I guess you can say that it’s a new addition to the Toy Story series... So what kind of story will unfold there? Nomura: At the beginning of Sora’s adventure in the Toy Story world, he’s mistaken for the character of a new game that’s to go on sale. It wasn’t put in the trailer but, the dinosaur toy, Rex, mistakes Sora for that game character as well. — So, Sora is mistaken for the figurine of the character of a new game, I see… The toy-like designs of Sora, Donald and Goofy are also refreshing to see. Nomura: The art directors of the KH team designed them, and with a bit of back and forth with Pixar they became the way they are now. At the beginning, we hoped for a design that resembled more of an action figure, but we took on board various bits of advice from Pixar to make them match more of the feel of the Toy Story world. The result you see is the point of compromise. We received many suggestions from representatives of Pixar in charge of setting, story, and character designs etc. in order to forge the shape of the Toy Story world. Both us at Square Enix and the people at Pixar are very picky about what goes in, so we aim to reach a point where all parties could come to agreement and go from there, properly taking time to discuss everything clearly. — Well that must be why all the Toy Story characters, especially Woody and Buzz, look like they’ve been ripped right out of the original film! Nomura: We received data from Pixar to use as samples, however just like I never imagined that they would be able to reproduce the characters to such a level, Pixar were incredibly taken aback. And so, compared to all previous KH games, our power to create expression has increased dramatically, so each world will have their own expressive and unique visuals, whereby even things like the gimmicks of each world will be different from each other. It feels like we’re creating multiple games at the same time, it’s quite the work (wry laugh). — Sounds like tough work. By the way, was there any reason that you chose D23 to announce the Toy Story world? Nomura: Actually, it has been in a relatively complete and showable state from a while back, but according to Disney’s intentions and promotion plans, I held back on revealing anything. It’s a very popular film, so we discussed where would be the best place to announce it, and we thought that D23 was quite suitable. Last time at D23, we announced the Big Hero 6 world, however it was a sudden request so I could only draw up one small illustration. So, I wanted this D23’s announcement to be in video form for everyone to enjoy watching. — There are also a lot of interested fans waiting for further information on the Big Hero 6 world. Will there be any follow up news soon? Nomura: Development is coming along fine, but it was the last world that we decided on, so compared to the other worlds we have planned, Big Hero 6 will have to wait a little longer. — In regard to the fighting style shown in the battle scenes, we were able to see many commands for forms and finishers appear on the screen. It seems like a system close to KH0.2, but there were times with more than 5 commands on the screen at once. It seems that this time strategy has been taken even further beyond what was available in KH0.2. Nomura: That’s exactly how I wanted battles to be this time. As battle rages, I wanted there to constantly be a list of options ready, where you are able to sift through and select the command you desire. Depending on the order that you select the commands, you are able to construct different combinations, so by nature it creates a very fun and tactical environment. At first glance it may seem a little difficult, but as always, even with simple inputs you will be able to deliver flashy combos. Even random button presses will have your combos continue to evolve so if you’re not too strategically minded there’s no need to worry. — While having the extravagant Keyblade transformations, you are also able to simultaneously change clothing (Forms). Both transformations, clothing and Keyblade are quite vibrant, it really is impressive. Nomura: The several Forms that are available are divided among each Keyblade, according to their traits. Just as before, as you go from world to world the Keyblades you obtain will differ depending on the world you obtain it in. And of course, they are not just usable in their own respective world, you can freely use them among any world. Forms included. — Toy Story’s Keyblade can change into a hammer and a drill, but the drill really had a big impact. The patterns of transformations between Keyblades will not overlap one another, and each will evolve into some pretty crazy designs (laughs). — The Keyblade from Hercule’s world will transform into a shield. According to prior news, at that point, Sora will enter the “Guard Form”. On top of that, will you be able to attack with it, and not just guard? Nomura: Actually, it’s not the “Guard Form”, it’s now officially become the “Guardian Form”. This is in reference to the “Guardian” in the “Guardians of Light”, so suitably he will also be able to utilize the shield to attack. Sort of like how Goofy does (laughs). I’m sure you noticed the huge fists that appeared and delivered a frenzy of punch attacks, that’s actually a counter attack that only the shield transformation can utilize. And of course, it’s not only that counter that’s available, we’ve also prepared devastating finishing moves too. — Oh so there’s counter attacks too, is there? — With the Keyblades, according to their current transformation, the actions available vastly differ from each other. So then devising effective strategies against enemies, for example against bosses, may vary in difficulty depending on the actions available. Nomura: I think to some degree there will be transformations that are more or less compatible with certain foes. However, there won’t be cases where there will be only one specific strategy or transformation that will ensure victory. It’ll be fine for players to choose whether to use their favourite battle style, or to opt for something a bit easier. 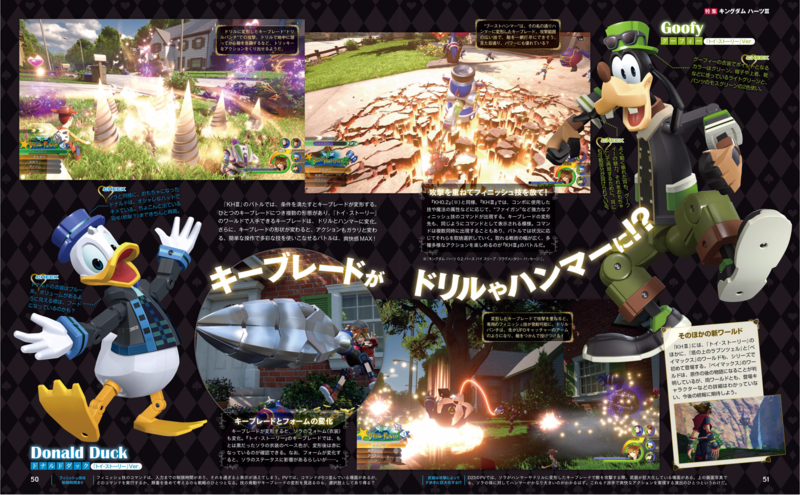 — In the Orchestra trailer, we saw some other parts of the battle system, like a combination attack with Goofy. Nomura: In battle, if you satisfy the right conditions, you will be able to deploy combination attacks at a button press. And it’s not only combinations with Donald and Goofy, just as always, you will be able to team up with the various heroes from each world too. For example in the Toy Story world, you’ll be able to have Woody and Buzz in your party, so you can launch combination attacks with them. As for the construction of parties, there’s a new system in place which I’ll be introducing at a later date. — I’m looking forward to seeing what sorts of combinations are possible. In the Toy Story world, jumping in the robots and fighting with them seems like a really interesting concept. Nomura: From the beginning of development, at the time that I told the team, “let’s do this”, part of what I said was to include mountable robots which would then suddenly turn the gameplay into an FPS (laughs). There are actually a few types of robots you can mount, like the red robot will be able to directly attack with a shoulder tackle, and the purple robot will be able to fire projectiles out of a canon. The robots will each have a main battling style. On saying that, though, if you go to other floors of the Toy Shop, there will be different gimmicks available for you to use. — There are other floors you’ll be able to access? Nomura: What we showed in the trailer this time was the opening sequences of the Toy Story world, but the main area of the world will be the “Toy Shop”. In this Toy Shop, there will be many sales floors. The floor you will be able to find the robots and mount them will be the floor that has them up for sale. In the Toy Shop, you’ll be able to visit the various sales floors and enjoy the respective gimmicks of each. — It’s like multiple games in one! You’ve outdone yourselves! Nomura: I think that’s a good thing, but that’s probably because the team overdoes it a little (laughs). They are constantly improving themselves to surpass expectations, and create top quality content. Otherwise, they think that it’s not enough. I think fans will be quite surprised with future announcements. — By the way, this time you debuted the Toy Story world, but other than Disney worlds, will there be any new original worlds? Nomura: In a previous trailer, there was a scene where Xehanort and Eraqus from their earlier years are together playing a game like chess. That world is an original world. This time, the number of Disney worlds themselves are fewer than KH2, but the overall content available in each world has become quite vast. They’ve truly become worlds you’ll be able to play until your heart is content. — With all that quality content being packed into each world, there’s no doubt that KH3 is becoming quite the rich game indeed. 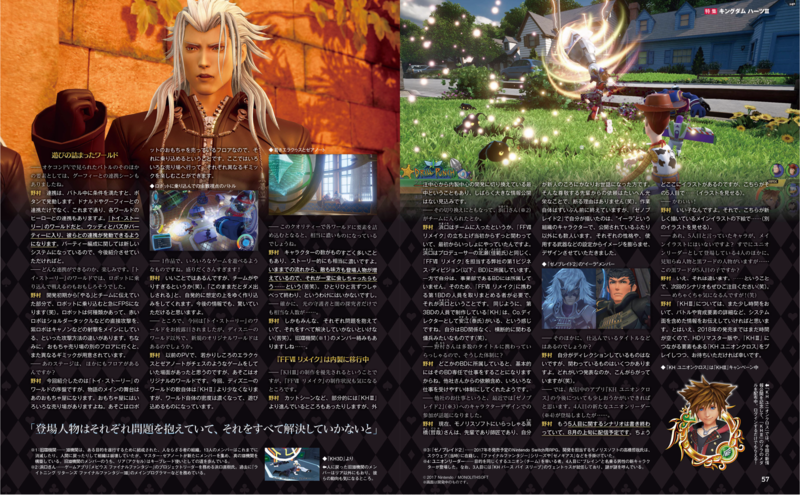 Nomura: With the amount of characters involved this time, the story is also becoming quite rich. Because of the chain of events so far, the number of both friend and foe have multiplied. There’s too many to even have them all assemble together in one place (wry laugh). Additionally, I can’t just let each character speak one line and just be done with. — KH3 is the main priority right now but, the current state of the FFVII remake also piques our interests. Nomura: There are some parts of the remake, such as cutscenes, which are actually further developed than KH3, but due to the fact that we’re currently right in the middle of switching from out sourced focused development to inner house focused, there’s a chance that there won’t be any sort of large revelations for a while. — Huh, the 5th leader isn’t in this sketch? Among the other revealed 4 Union Leaders are... an unknown character and someone in a black hood. Is the one in the black hood the 5th Union Leader? Nomura: Nope. And with that, please pay close attention to what will unfold in the next scenario (laughs). Nomura: In regard to KH3, there’s going to be another small intermission, but next time I’ll be announcing more finer details about various systems, such as the battle and levelling systems. Also, up until the 2018 release there’s some idle time, so please fill that up by playing the HD remasters and Union Cross, of which Union Cross includes content connected to KH3. We thank you for your patience. 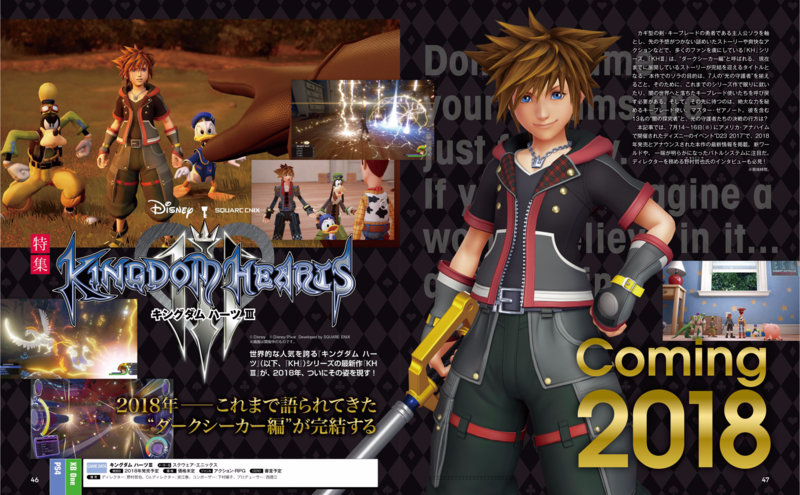 Really liking the improved render of Sora. Hey hey hey I spy a chariot it's been so long since we've seen it! Thanks for the full translation, I want to make sure those statements about BH6 being the last world is the real deal. Looking forward to the translation. Time to see officially, without any doubt, what Nomura is saying in this. The original render of Sora was released to the public before 0.2 Birth by Sleep: A Fragmentary Passage was announced, so it was inevitable that it'd get touched up with the latest iteration of the Kingdom Shader. So... that's the reason why his render is better. Were you expecting a debate out of my response? Awkward that it's still from the old build though. You can see the numbers on the EX gauge and the command menu is blue despite being in battle. Anyways, it doesn't really matter anyway. Thanks to Saken, we have half of the interview translated! Thank you Saken for the translations. I really wished somebody asked Nomura about NPCs and whether we can switch keyblades on the go. but as always, even with simple inputs you will be able to deliver flashy combos. Even random button presses will have your combos continue to evolve so if youâ€™re not too strategically minded thereâ€™s no need to worry. â€” The Keyblade from Herculeâ€™s world will transform into a shield. According to prior news, at that point, Sora will enter the â€œGuard Formâ€. On top of that, will you be able to attack with it, and not just guard? Nomura: Actually, itâ€™s not the â€œGuard Formâ€, itâ€™s now officially become the â€œGuardian Formâ€. Oh, so they changed it to Guardian Form? Hmâ€¦ I liked 'Guard Form' more, but meh. I totally understand if not since it's asking a lot but any chance we could please have this other Nomura Famitsu interview that was posted today also translated? Or just a translated short summary of interesting bits? Totally understand if not but worth asking. I see so it is true, I guess the Big Hero 6 thing was true. Unfortunate, I would've loved to see Inside Out and Zootopia. This is probably a really...really huge stretch but it would be pretty cool if this had something to do with Wreck It Ralph. Nomura: At the beginning of Soraâ€™s adventure in the Toy Story world, heâ€™s mistaken for the character of a new game thatâ€™s to go on sale. It wasnâ€™t put in the trailer but, the dinosaur toy, Rex, mistakes Sora for that game character as well. The more Nomura talks about SCs, the less I think that them showing up after a few hits was just for trailer purposes. Having 5 SCs available at once seems to be what he's going for. Yes, and it worries me. I also thought it was just for the trailer, but ughh. The fact that skill just apparently isn't needed at all isn't good, either. Do you guys think making the time to use them longer would help? My problem with 0.2 is that "saving" a Za spell for future use was almost impossbile, for the time was up before I could put myself in a good spot. That's still not confirmation that it's canon to the Toy Story cinematic franchise. Big Hero 6 has the same situation, it's in a parallel plane to the original because Big Hero 6 as a team was already formed without Sora and company's interference. How do you know big hero 6 takes place in a parallel plane? The world is going to take place after the events of big hero 6 as a sequel. All of the problems would be solved if SCs didn't exist to begin with. Dudeâ€¦ ugh, okay. Talking to a wall here. In terms of the keyblade transformations, similarly it's very unique because it's not activated until certain conditions align and you are given that opportunity to execute the transformation. Even then, you can also choose to not activate it and continue your melee attacks, but when you do activate it as you continue hitting your enemies and your combos continue to chain, then it will transform yet again. [FONT="]I tried to make it so that it's a freedom that the player has and they can choose; each of them are sort of unique in its own way and you also have your regular attacks as well; your melee attacks, your magic attacks. Depending on what timing you're faced with in your battles or whatever conditions that are involved in your combat kind of depends on your strategy. I said parallel plane to the original. In layman terms, it's based after the events of the feature film, not an alternate retelling of the feature film. Dude, I am aware that the Toy Story narrative takes place between Toy Story 2 and Toy Story 3, I just don't believe that the Toy Story world is canon to the Motion Picture franchise. Is that too hard of a thought to believe in? Nomura: The Toy Story world isnâ€™t simply a sort of abridged telling of the original Toy Story plot with Sora and co. being thrown in. The events that occur take place after the 2nd movie. The setting of the story is not in a parallel plane to the original. Everything that happens in KH3 will be on the same timeline as the Toy Story series. It's not a hard thought, it's just plain false. It's confirmed the world is canon to the movies. Period. â€” Sounds like tough work. By the way, was there any reason that you chose D23 to announce the Toy Story world? Nomura: Actually, it has been in a relatively complete and showable state from a while back, but according to Disneyâ€™s intentions and promotion plans, I held back on revealing anything. This matches what I heard. Apparently Toy Story was meant to be announced in June 2013 but it was cut at the eleventh hour. It's interesting that the transformations & even certain drives are locked to the specific keyblades. I know with certain games that by the time you get really high up in level that the stat bonuses offered by different keyblades becomes negligent but while leveling during the story, especially on higher difficulties having the right keyblade can be a gamechanger. "Nothing stated confirms that Sora is canon in the Pixar universe, only that the events of Toy Story 1 and 2 have already happened in the world we visit in Kingdom Hearts 3. and to further clarify, it means that the timeline is from Toy Story 1 to the latest short, so the story takes place officially on the timeline between Toy Story 2 and 3, but is not canon to the Pixar movie universe". It would definitely help. It's not as practical as choosing them from the command menu and having them cost MP or Focus, but it's a nice alternative. Assuming we'll have abilities back, there will probably be a few stackable ones that increase the time they're available. Though the problem I see with this is having a bunch of them blocking off the left side of the screen for a while. Hopefully the requirements for obtaining them are more consistent than in 0.2. Did anyone ever find a surefire way to trigger Wayfinder on the Demon Tide fight? Birth by Sleep was my favorite of the franchise & I'll sorely miss the deck commands but with the return of shotlocks, an enhanced combo meter that gives us the options of drive forms, keyblade transformations, combo finishers, & stronger magic attacks I think I'll be okay. as far as the the options covering to much of the screen... well as someone whos played FFXIV for about 3 years now trust me you get use to HUD elements covering the screen. Granted in MMOs you could completely customize your HUD, so I guess it isn't quite the same. Yaay, this makes me happy. So we do indeed get to see more of the old Organization! Additionally, I canâ€™t just let each character speak one line and just be done with. I'm glad of that, hope it truly applies across the board. This way, maybe we can finally learn more about Larxene and Marluxia's motives. Speaking of lines, I hope Kairi's are done by Hayden. I heard she wasn't in 0.2, and as it's the most recent game, that's discouraging. I'd be sad if she doesn't return for 3. So let me get this straight, we have the fifth leader, another original character, and another character in a black hood? man, this really is the Forteller gang re-created. And I'm glad to see that even Nomura's aware of how large he has made the Kingdom Hearts cast. I wouldn't be worried. Besides BBS, Hayden never spoke Kairi in minor roles. Was her part in 0.2 that minor? There was one her 1 line as Xion in 3D, too. I mean, yeah, she hadâ€¦ like 9 lines. Plus/minus 2. I remember hearing something along those lines at one of the D23 Expo Japan fan events. It was at some venue where we couldn't verify if the info was legit or not because everyone was too excited. Don't get too high hopes on this one though as while this unmistakenly shows that Nomura has them in mind it doesn't mean the coverage specifically on the more obscure members of the old Org will be very detailed or in-depth. I can see the former apprentices of Ansem the Wise gain roles of similar importance to Leon and the gang though. Maybe the issues with them feeding people to the Heartless and destroying Radiant Garden will even be addressed and not swept under the rug like it was a minor inconvenience. â€” With all that quality content being packed into each world, thereâ€™s no doubt that KH3 is becoming quite the rich game indeed. Nomura: With the amount of characters involved this time, the story is also becoming quite rich. Because of the chain of events so far, the number of both friend and foe have multiplied. Thereâ€™s too many to even have them all assemble together in one place (wry laugh). Additionally, I canâ€™t just let each character speak one line and just be done with. I certainly dig these statements as it shows Nomura being aware that he can't just write off at least the central characters with one-liners and/or just a journal mention. As for the "not being able to assemble them all together in once place", well, if the will is there I am sure they could manage a gathering of at least the central cast on the beach for the credits, lol. It is also clear now that earlier claims from some sources across the net about KH III's story being "dark" stemmed from mistranslations as Nomura speaks here only about the story being "rich", meaning packed full with content but that is something the fanbase has stated for years already since Nomura expanded everything so much before closing/settling some of the open issues beforehand. To be fair, not all of the Organization XIII members need that much spotlight shined on them anyway. That also begs the question, what arcs do the former Organization XIII members need to resolve? they've already been turned back into their somebodies? At best, I can see the Radiant Garden members wanting to retrieve Ansem the Wise, and Larxene's somebody to apologise to Namine through Kairi, but that's honestly all I've got. Well I certainly need Marluxia's fabulous hair in KH3 graphics. Still hoping those flower petal enemies in the Tangled world mean he'll be back. I don't care how, as a boss fight, optional fight, as an NPC running a flower shop in Twilight Town... I just want to see my fave pink dude one more time. Late response but thank you, that's good to hear. I can definitely wait for it (the other Famitsu interview).